The sportsmanship Cabrera showed in that heart-stopping play-off defeat to Australia’s Adam Scott on Sunday marked the big man out as a special golfer and it’s no wonder that Waterville’s Mark Murphy is thrilled to make his PGA Tour Latinoamérica alongside the Argentinian at Córdoba Golf Club this week. 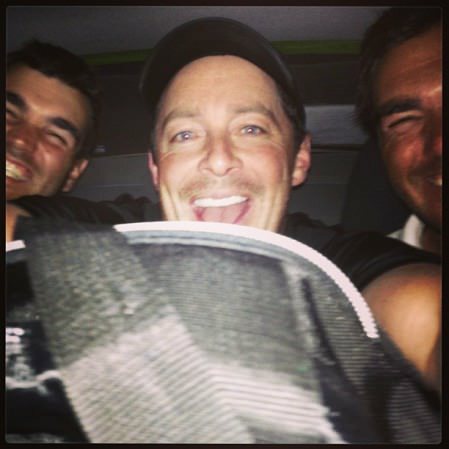 The 34-year old Kerryman is living the golfing dream in South America, Instagramming this hilarious picture of his arrival in town for the $150,000 event and his bid to finish in the top five in the money list and win his Web.com Tour card. Having grown up in poverty before rising from the ranks of barefoot caddie to become a world star, Cabrera is idolised in Cordoba for his golfing achievements as well as his donations to charity through his Foundation. I spotted him exiting the smoking lounge in Atlanta airport on Tuesday afternoon - (don’t tell his doctor or his dentist) - and he had no trouble offering a smile of recognition for a familiar face. Check out this PGA Tour video (below) which brilliantly illustrates the special place that Villa Allende locals have in their hearts for Cabrera. His presence in the third event of the PGA TOUR Latinoamérica’s second season is a huge boost to the 82nd staging of the Abierto del Centro, which is one of the most prestigious tournaments in Argentinian golf. Both men have won the title seven times each, matching Roberto De Vicenzo, who celebrated his 90th birthday last Sunday on the 45th anniversary of the scorecard error that cost him the chance to playoff with Bob Goalby for the Masters. Martín Pose is the all-time record holder with eight wins in a tournament that was first played in 1927, when the local pro Héctor Bozzachi took the title. Sam Snead (1941) and Andy North (1980) are two of the American major winners to lift the trophy while Cabrera has triumphed in 1994, 1997 and five times between 2000 and 2007.